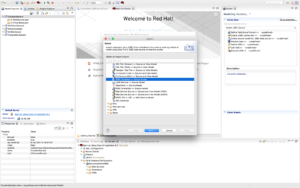 After Unlock your Hadoop data with Hortonworks and Red Hat JBoss Data Virtualization episode, let’s continue the journey with another “Apache Hadoop” episode of the series: “Unlock your [….] 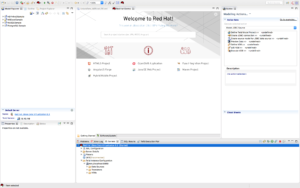 data with Red Hat JBoss Data Virtualization.” Through this blog series, we will look at how to connect Red Hat JBoss Data Virtualization (JDV) to different and heterogeneous data sources. 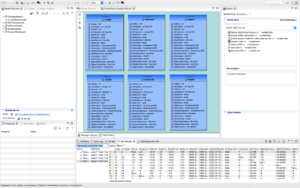 Connect: Access data from multiple, heterogeneous data sources. 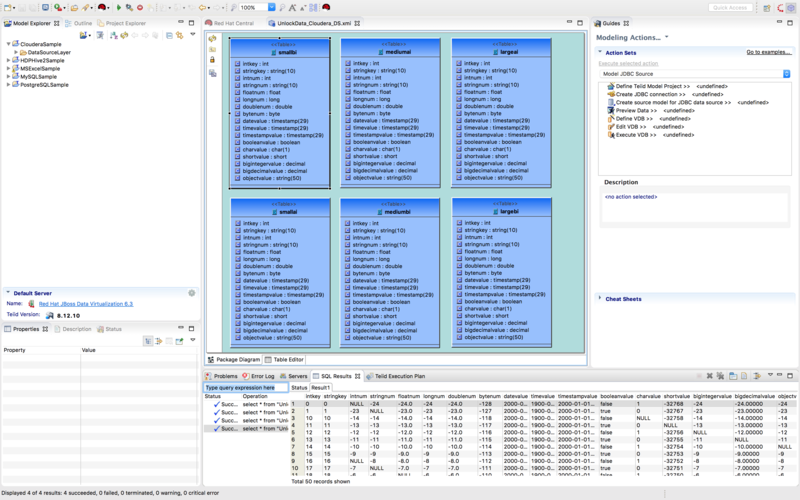 Compose: Easily combine and transform data into reusable, business-friendly virtual data models and views. 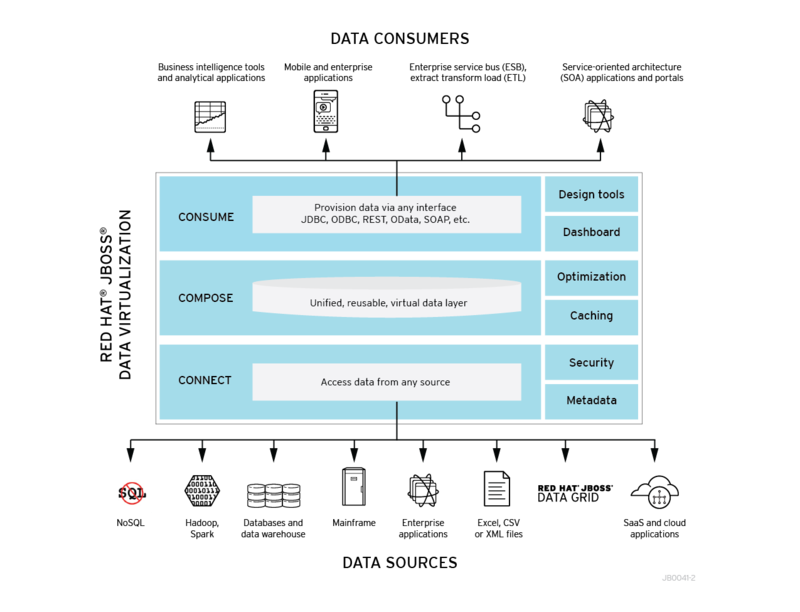 Consume: Makes unified data easily consumable through open standards interfaces. It hides complexities, like the true locations of data or the mechanisms required to access or merge it. 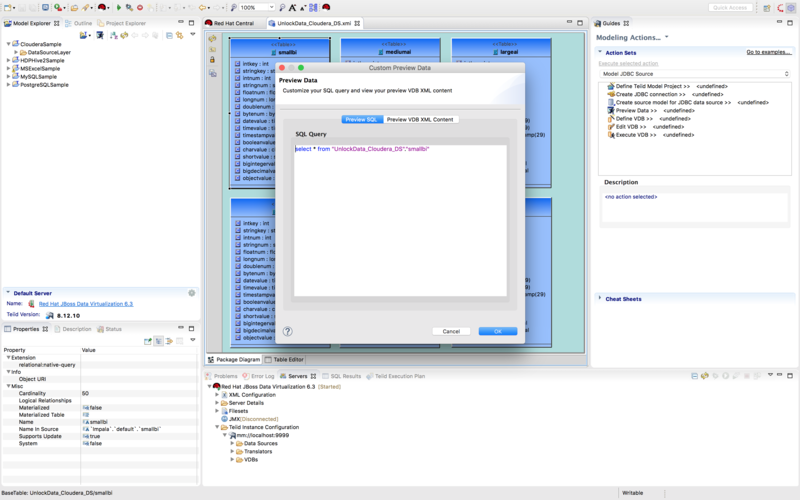 Data becomes easier for developers and users to work with. 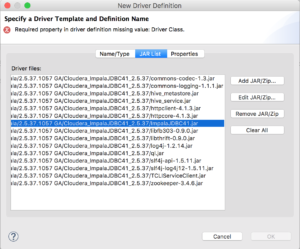 This post will guide you step-by-step on how to connect JDV to Cloudera Distribution Hadoop (CDH) via Cloudera JDBC Driver for Impala, using Teiid Designer. 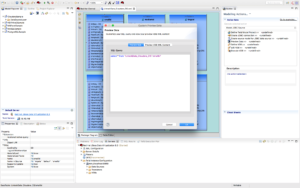 We will connect to a Cloudera Distribution Hadoop (CDH) using the Cloudera Impala Translator. 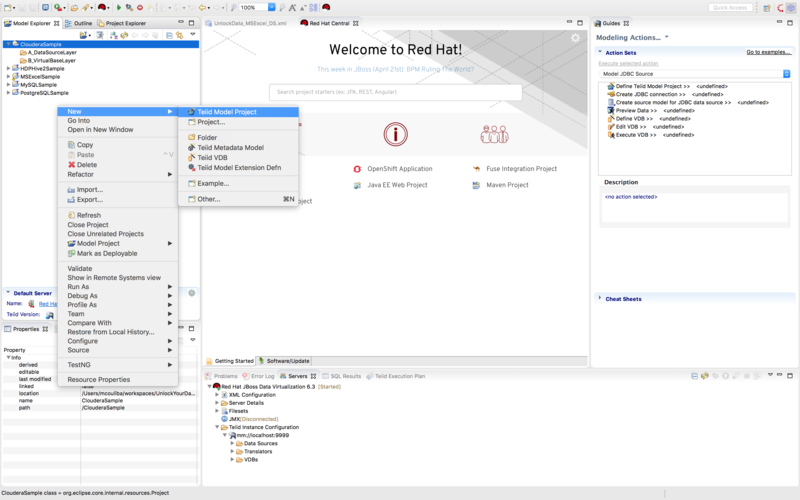 A translator acts as the bridge between JBoss Data Virtualization and an external system. 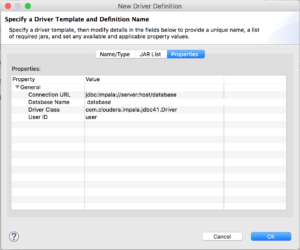 We will refer to the installation directory of JDV 6.3 as $JDV_HOME. Install: Follow the installation instructions. 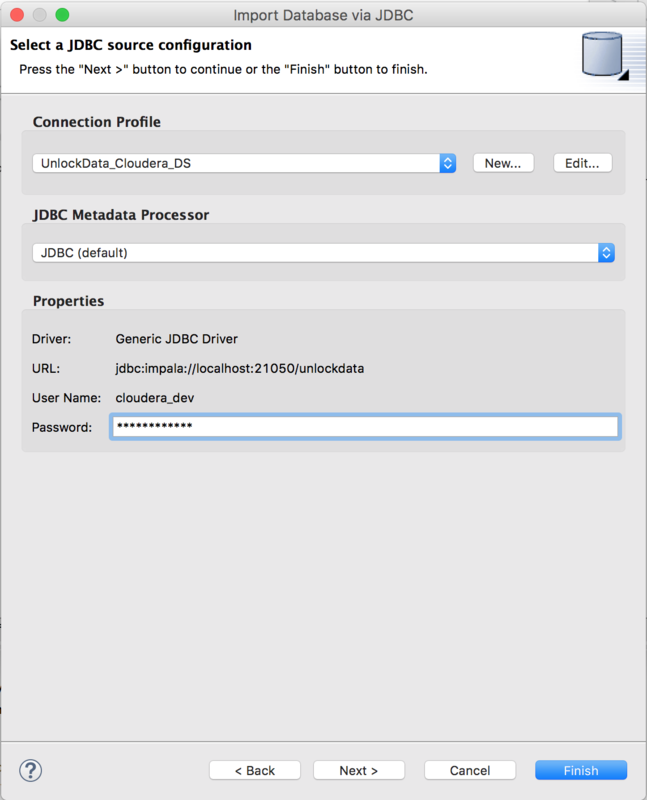 In this example, we will connect to a database called “unlockdata” with the username/password “cloudera_dev/cloudera_dev”. 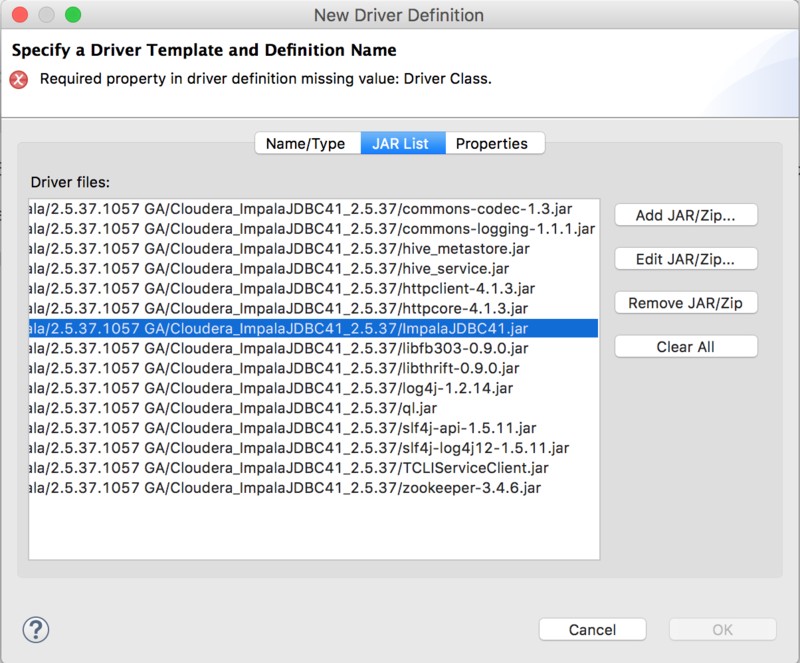 We will refer to the directory with this jar file as $DRIVER_HOME. 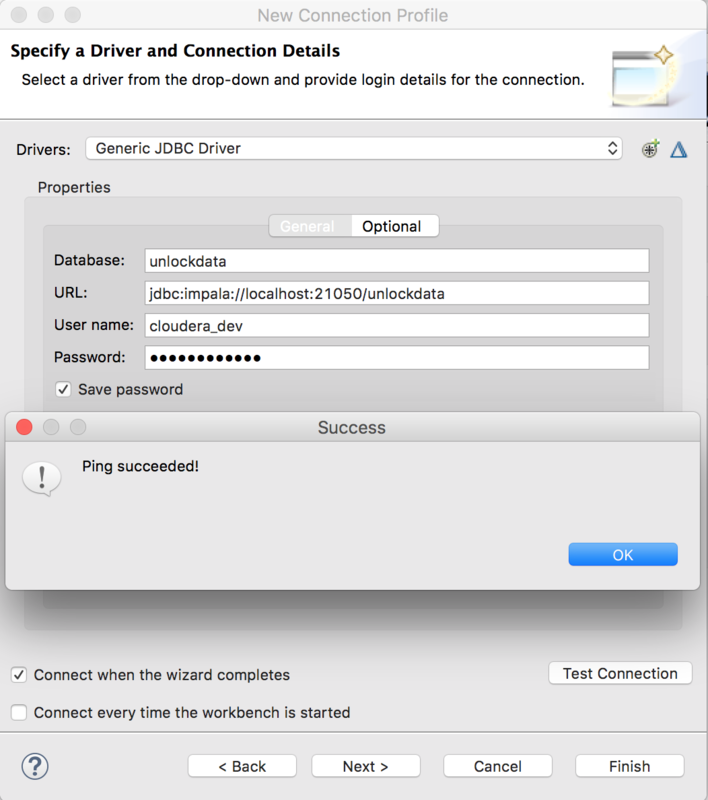 The Cloudera Impala Translator is provided with JDV. No installation needed. Note: Please visit to discover all the translators available with JDV. 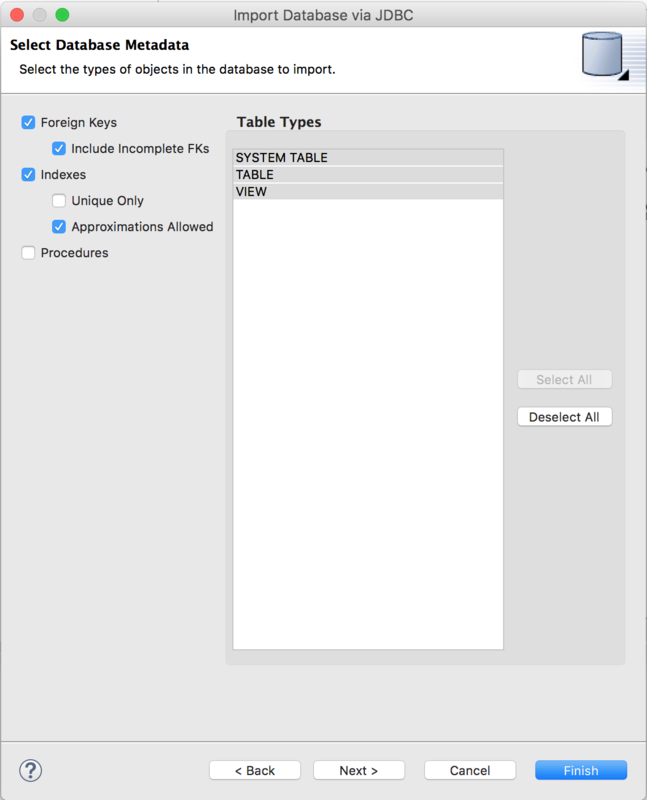 If you cannot find a suitable translator for your system then you can develop a custom one. 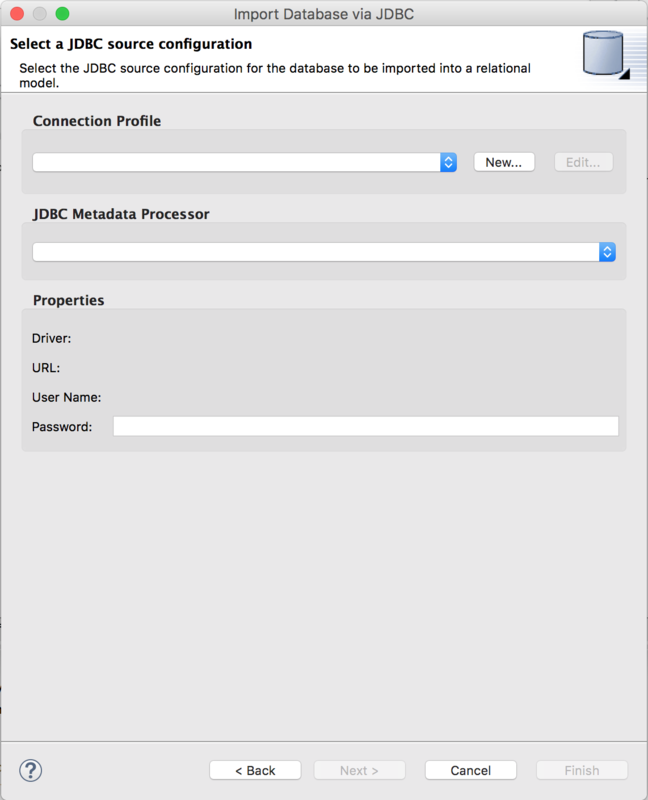 We are now going to import metadata directly using the Teiid importer. 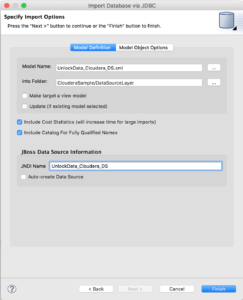 Right-click the project “ClouderaSample” and select Import and select “JDBC Database >> Source Model” as shown above and click “Next >”. 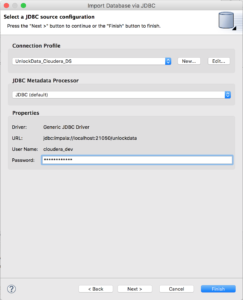 Note: See https://github.com/cvanball/unlock-your-data/tree/master/cloudera for more information. 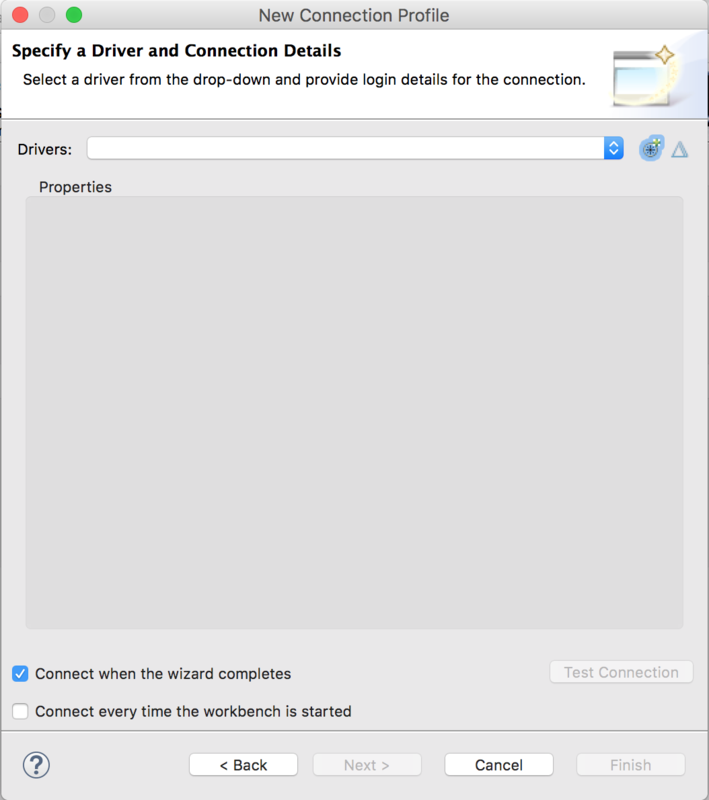 On the first page of the wizard, click “New…” to create a new Connection Profile. 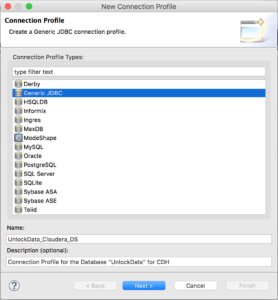 Before we can proceed, we need to setup a new connection profile to be able to connect to the CDH using the JDBC jars previously downloaded. 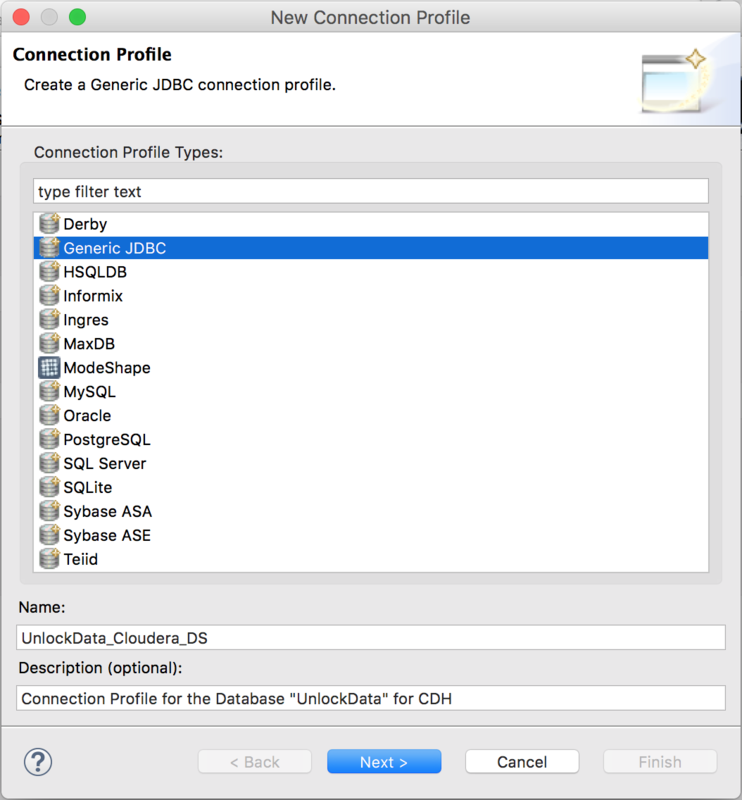 Select “Generic” for the Connection Profile Type and name the Connection Profile “UnlockData_Cloudera_DS”. Click “Next >”. 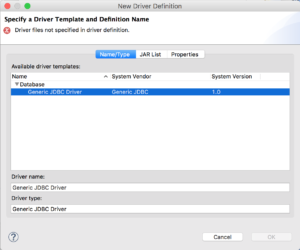 Click the “Add Driver Definition” button . 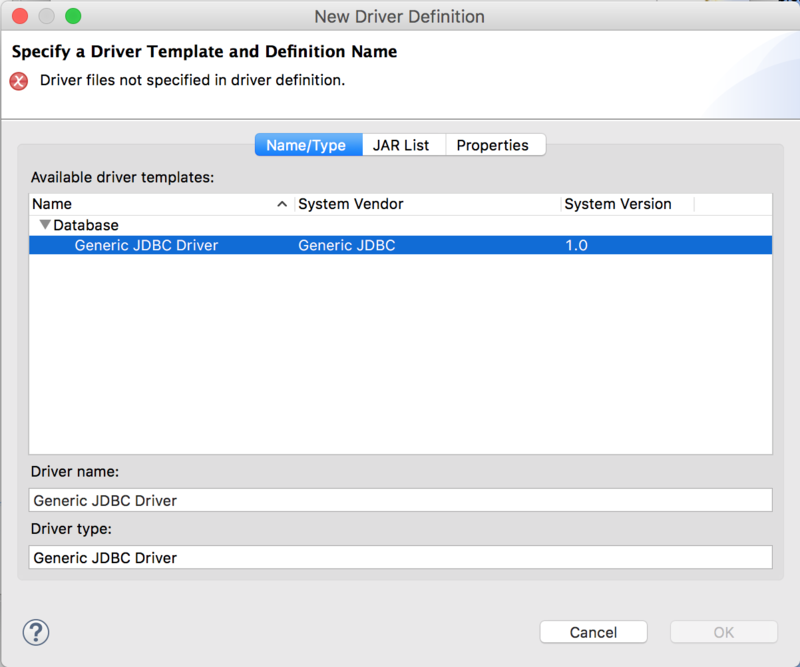 In the “Name/Type” tab, select the right driver template (“Generic JDBC Driver”). 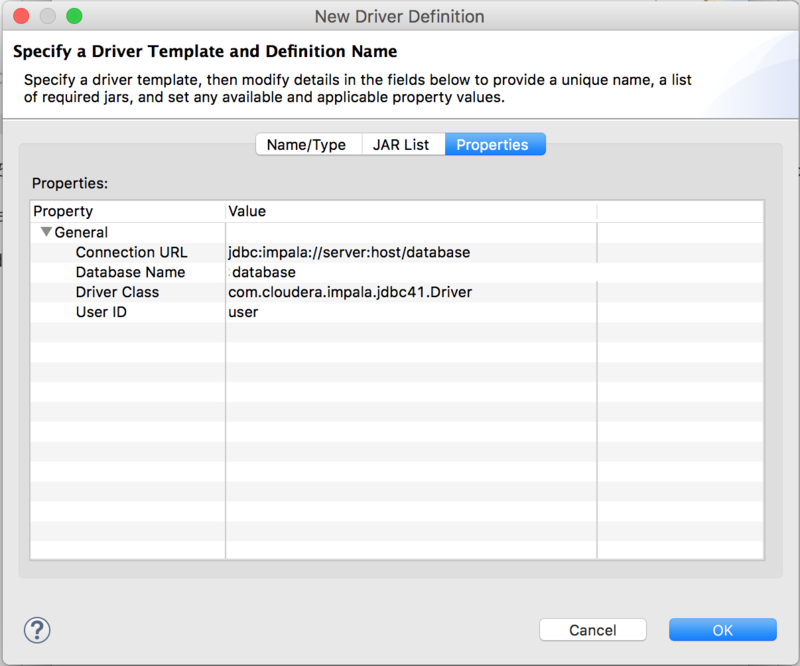 In the “JAR List” tab, click “Clear All” and click “Add JAR/Zip…” to add the JDBC driver jar files, $DRIVER_HOME/*. 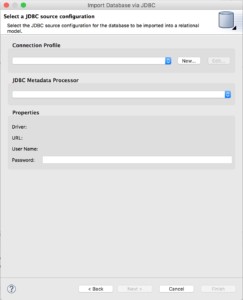 Click “Ok” and now we are ready to connect to the CDH via Impala by providing the correct connection details. is the port number the server is listening on. The default port number is 21050. 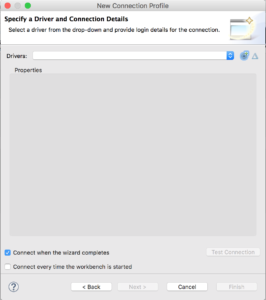 Check “Save password” box and Click “Test Connection” to validate if the connection to the server can ping successfully. 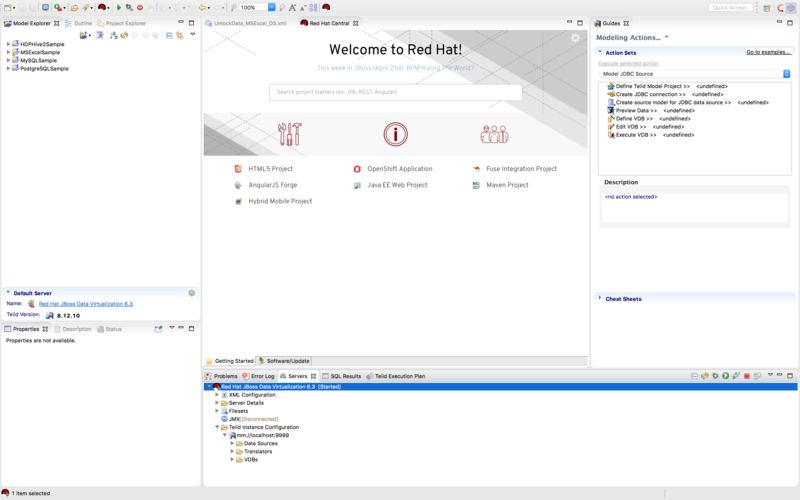 Since the connection can ping successfully, we are ready to select tables from the CDH and create a source model out of it. Click “OK” then “Finish”. 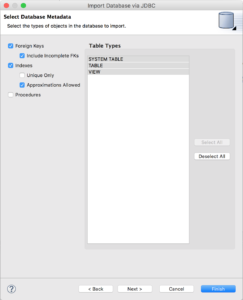 Click “Next >” twice to select database objects. 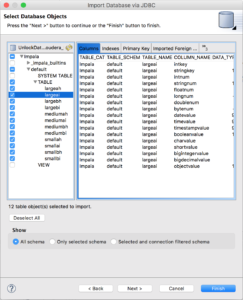 Select all database objects you want to import then click “Next >”. 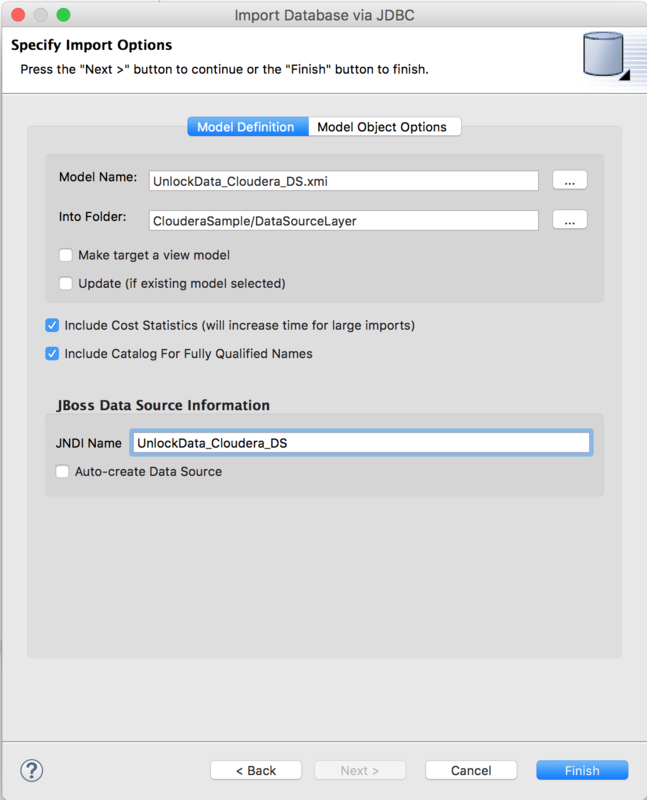 Specify the target folder for the source models (here “ClouderaSample/DataSourceLayer”). 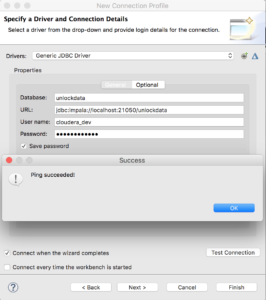 Make sure that the JNDI name corresponds to the one we created in the JDV environment (Hint: UnlockData_Cloudera_DS) and that Auto-create Data Source is not selected. Click “Finish” to create the source models. In this post, we’ve shown the configuration steps needed to perform in order to unlock your Cloudera data using Cloudera JDBC driver for Impala with Red Hat JBoss Data Virtualization. 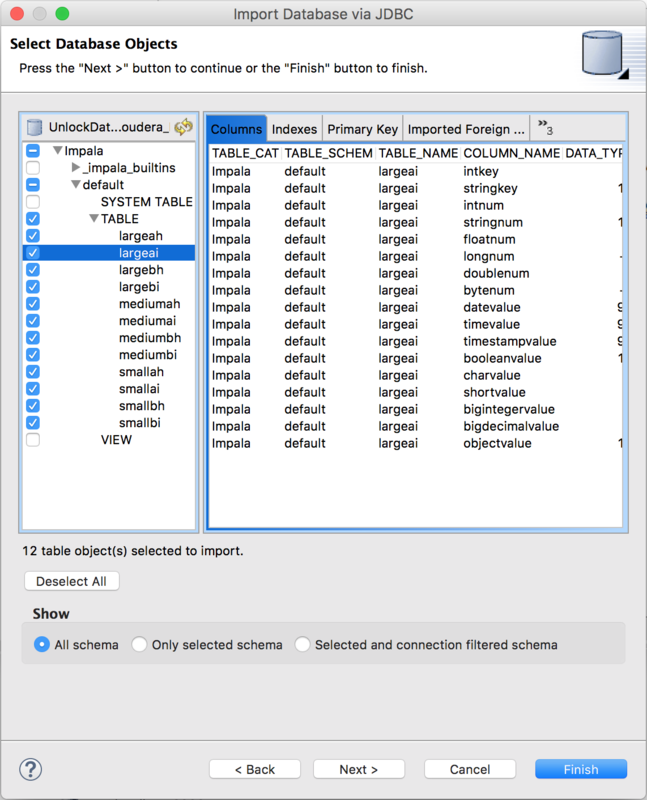 Now we are ready to federate this data with other data sources from physically distinct systems into such as other SQL databases, XML/Excel files, NoSQL databases, enterprise applications and web services etc. 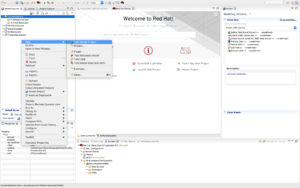 Click here to download JBoss Data Virtualization and accept the terms and conditions of the Red Hat Developer Program, which provides no-cost subscriptions for development use only.